Do You Need A One On One Trainer? You value your health and see it as a priority. You know it’s worth investing time and money in. If you’re thinking about working with a trainer one on one, or already are, this could save you a TON OF MONEY. Maybe this story sounds familiar: You head on over to 24 hour fitness and sign up for a 10 session starter package with a trainer. You end up paying 80 bucks a session for a 20-something kid, fresh out of high school with a weekend certification to stand and count to 10 while you do exercises. Personal training has long been seen as the “gold standard” for the best way to get in shape. I think nearly everyone would have a personal trainer if they could afford it. 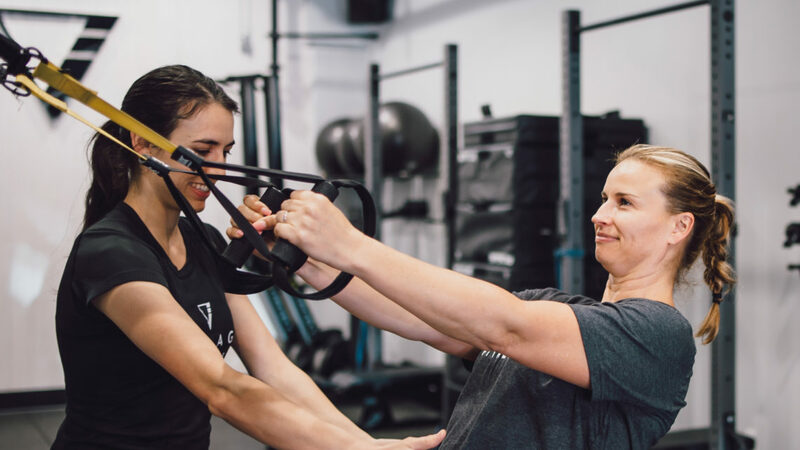 A trainer makes sure you show up for each and every workout and ensures the workouts are effective, challenging, and appropriate (at least they should). Some folks need a one on one trainer. In fact we offer one on one training for this very reason at Village. I worked with a client before we began small group training at Village. Let’s call her Jane. Jane never missed a session. She would always show up early and be ready to rock. Once we started small group training, I encouraged her to try the group. Within a few weeks, she was no longer showing up consistently. She said she would wake up and hit the snooze button. She knew the session would still go on even if she wasn’t there. Jane needed to know someone was waiting for her to meet one on one to get her buns out of bed and get to the gym. If you have injuries, working with a trainer one one one allows you to work around your issues and still get a great workout. As a doctor of physical therapy, I work with clients one on one who have injuries. I see them more as personal training clients than physical therapy patients. I get to help them get in great shape, overcome their injuries, and build healthy nutrition habits. It combines all the skills I’ve built and learned over the last decade as a student and coach. If you’re training for something specific like a sport or competition, a one on one trainer may also be the best solution. What about the people who are looking to get in great shape, maintain a healthy weight, and learn how to optimize their health? Melody was just like this. Melody was a one on one client of my wife’s. They worked together for a few years. Melody got great results. She leaned out, got stronger, and was feeling great. About 6 months ago, Melody told Nicole she needed a more affordable option than one on one training. Nicole suggested she try small group training. She loved it! She continued losing weight, building healthy habits, and getting fitter. She found the community aspect of small group training extra-encouraging. It made her workouts more fun and lively than a one on one session. Small group training at Village is like having a one on one trainer for a fraction of the cost. There is SO much power in the community aspect of what we do at Village. You have a group of 3-5 other people to encourage, energize, and push you towards becoming a healthier, fitter version of yourself. We coach people through building healthy nutrition habits. We have what we call The Village 12. These are the 12 most important habits lean and healthy people tend to have in place in their lives. We teach our clients to see food as a nourishing language of communication for our body. The beauty of small group training is that it’s just as effective as one on one training yet much more sustainable cost-wise than a one on one trainer. You can give small group personal training a try at Village for just $99 for an entire month! I can’t wait to see YOU experience the life changing community, coaching, and results of small group training at Village.